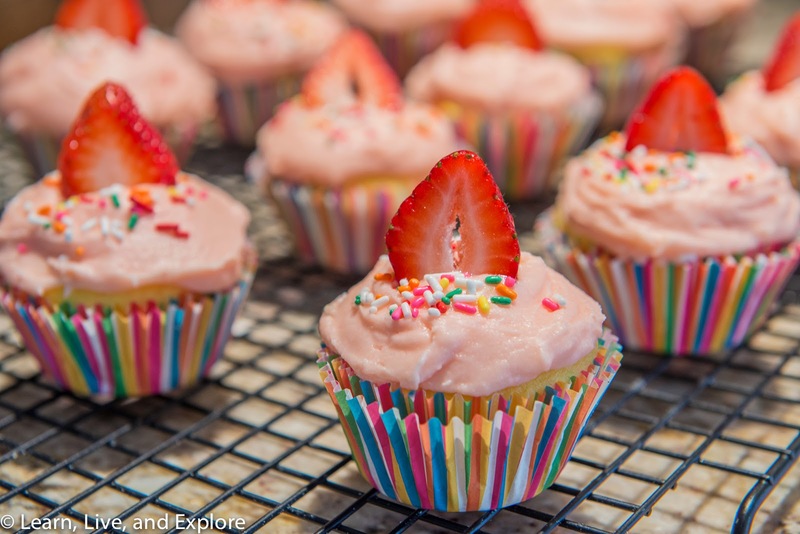 Strawberry Margarita Cupcakes for Cinco de Mayo ~ Learn, Live, and Explore! It's Cinco de Mayo amigos!! Of course, that means it is time to bake something that incorporates the tastes of Mexico. While I love traditional margaritas, I like to change it up and order a strawberry margarita or blended swirlie every once in awhile. With that in mind, I decided to make these lemon cupcakes with strawberry margarita flavored frosting to celebrate this year. I'll be honest, I was frustrated with the cupcake presentation on this one. I wasn't baking in my own kitchen, so I was missing a few of my regular tools for these cupcakes. Specifically, I was missing my large piping tips and plastic piping bags. The result is the frosting is messier than I prefer. But, I scrounged around in the pantry and saved them a little with some festive sprinkles and topped them with slices of delicious strawberries. And they taste good, which is the most important thing since you don't see the cupcake anymore when it's in your tummy! Bake cupcakes per instructions on the box and allow to cool. In a stand mixer, combine butter and strawberry purée on low speed until smooth. Keeping the speed on low, slowly add in the powdered sugar and mix until just combined. Add margarita concentrate and beat on medium-high speed for about a minute, until fluffy. Frost the cupcakes, preferably with a piping bag outfitted with a large tip.